Can you count to 5? Yes? Then you can do Hardanger! I’ll explain some of the basic terms and stitches. This post should give you an eerie look into who I am! 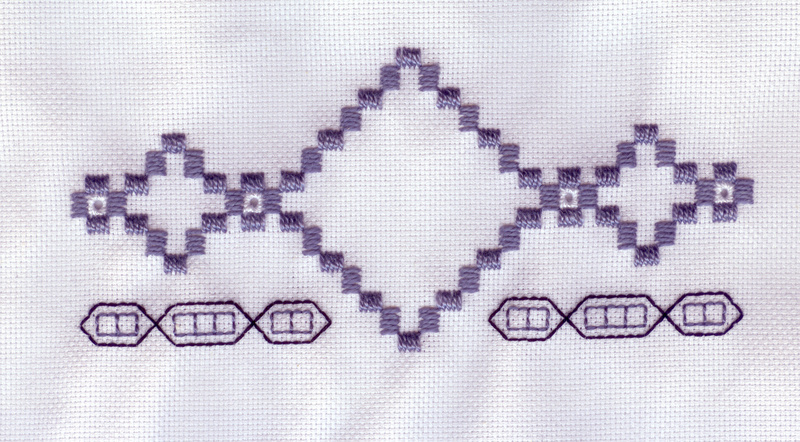 The first, most basic part of Hardanger is the satin stitch. Generally speaking (unless the pattern says otherwise), a satin stitch covers 4 fabric threads (count down 4 holes). That’s it. Easy, right? Next is your first Hardanger-ese term (yes, I make up words whenever it suits me) – Kloster. Kloster means a group of satin stitches. Say it outloud – it sounds like “cluster”. Generally speaking (again, unless the pattern says otherwise), a Kloster is a block of 5 satin stitches. Usually they are called Kloster blocks because that’s the way stitchers think of them. Klosters are created from satin stitches. The easiest and fastest way to create Klosters is to keep the needle on top of the fabric. To do this, bring your needle up through the fabric at your start point. Insert the needle 4 holes down from where you came up, but don’t pull through. Instead, “needle over” to the hole to the immediate right of where you first came up. Then pull the needle all the way through. Be sure to catch your tail on the underside of the fabric as you start. Continue this way until you have 5 satin stitches on top of the fabric. Now we’re going to pivot. This is easiest to do with your needle still in the “down” hole, and with practice you’ll learn how to do it that way. It makes the Klosters work up very quickly. So, turn the fabric counter-clockwise and count up 4 holes from where your needle is going down (think of this as an inside corner). Then bring your needle up. Now go back down in that inside corner hole, and needle over to the hole to the right of the top of your new Kloster. Make a total of 5 satin stitches, pivot, Kloster, pivot, Kloster. You just made a tiny diamond! Yay, you! That tiny diamond is the foundation of everything you need to know to do Hardanger. If you’ve actually completed that little exercise, you deserve a break and a treat, because you’ve just learned a new skill. Once I’ve had a chance to sit down with some fabric and thread and think about how to explain things so they make sense, I’ll do another lesson on Klosters, explaining how to make larger diamonds, so you can do things like the picture at the top. I was shocked to discover that I have most of the supplies already! Now I just need to sit down and work on it. I have a pattern that has a little bit of hardanger in each corner of the design. I was going to leave it off and stitch something else but hopefully I’ll learn how to do it and stitch it the way it was intended. That’s great! I suggest having a piece of “test” fabric that you use for trying the instructions, before trying to do the stitching on something you want to keep.Rebekah – how cool that you already have so many of the supplies! That makes it even easier to start! It’s not that I’ve been quiet – I was forcing myself to finish Colleen’s Egyptian piece before I came back to this. You know how it is! It’s done, an ready to be mailed, as soon as I can get to the post office. So now I can think more about how to move on with the tutorials!